It doesn’t matter if you are a student, teacher, home-schooler, principal, adult returning to the classroom after 20 years, or a friendly alien just trying to get a leg up in earthly biology; Khan Academy’s materials and resources are available to you completely free of charge. This is just a fantastic concept, and one that is tremendously well executed. Oh, and the backstory on how this all got started is great too. Salman Khan started out tutoring a cousin in math over the internet. Relatives and friends started asking for similar help and he began posting tutorial videos to YouTube. Three years after setting up his YouTube account, Khan quit his day job as a hedge fund manager to focus on his YouTube channel – Khan Academy. 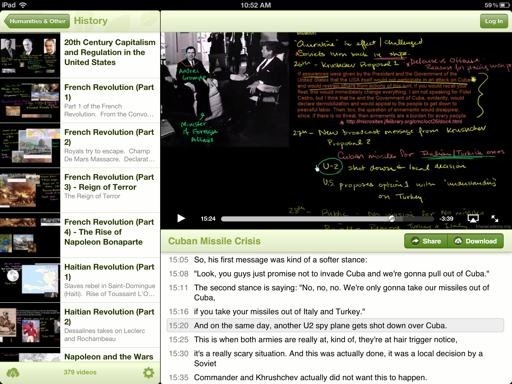 Our iPad app is the best way to view Khan Academy’s complete library of over 2,700 videos. Spend an afternoon brushing up on Statistics. Discover how the Krebs cycle works. Learn about the fundamentals of Computer Science. Prepare for that upcoming SAT. Or, if you’re feeling particularly adventurous, learn how fire stick farming changed the landscape of Australia. 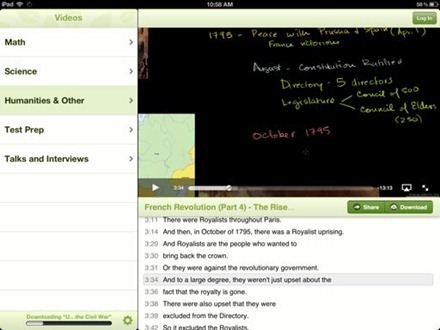 The videos cover a broad range of subjects. Main topic areas are Math, Science, Humanities and Other, Test Prep, and Talks and Interviews. The Math section ranges from Arithmetic and Pre-Algebra to Trigonometry, Calculus, Differential Equations and Linear Algebra. Science includes sub-sections for Biology and Chemistry, Physics, Healthcare and Medicine, Computer Science, and more. The Art History section (under Humanities and Other) is divided by eras – Ancient, Medieval, Renaissance, Baroque and so on. The history section covers US and world history. I found 7 videos just on Napoleon Bonaparte – great stuff. 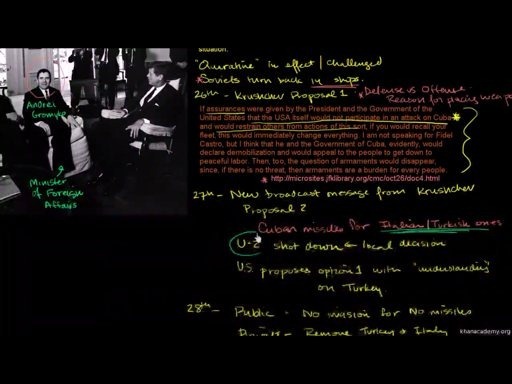 Khan doesn’t appear in the videos – he just speaks and writes and draws on the screen as a teacher would do on a blackboard. One of the key advantages of these videos is that they let students go at their own pace. Videos can be toggled in and out of full screen, and when they’re viewed in page they offer sub-titles that provide a full transcript. The app has AirPlay support so the videos can also be viewed on an HDTV. In the American Civics section (under Humanities and Other) there’s even a video on SOPA and PIPA, the controversial recent proposed legislation on regulating the internet. I’ve seen one bug in the app – in all the sub-sections of the Art History section it shows no videos, but when I tap to download it says they are already downloaded. The app is currently taking up about 1.1GB of space on my iPad, third highest of any installed app. Fortunately, the app offers a settings area where you can manage downloaded videos – so you can delete some if you feel the app is taking up too much space. I think this may be my favorite Best Free iPad App pick yet. I love Khan’s success story and just believe this is such a wonderful concept. I’ve got a 9 year old daughter so education is a subject that’s always on my mind. 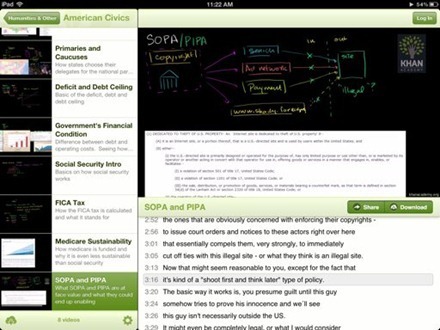 Having a superb resource like this on the iPad, for free, is a stellar example of what makes the iPad amazing. It’s an app I hope and expect my daughter will spend a huge amount of time with. Really, it’s an app that any of us could spend a lot of time with, and benefit greatly from doing so. 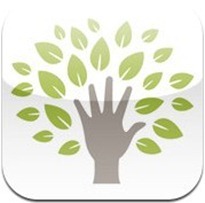 Here’s an App Store link for Khan Academy.